This year I was looking forward to the Midwest Clinic more than usual because Teacher promised to take me to Frontera Grill – a restaurant owned by Rick Bayless, a Mexican food god. We were hoping to go Thursday night, but when we talked to the concierge we discovered that Frontera doesn’t take reservations, and the wait was three hours. Three hours is a long time to wait when you’re hungry. Next to Frontera is one of Rick’s other restaurants, Topolobampo. 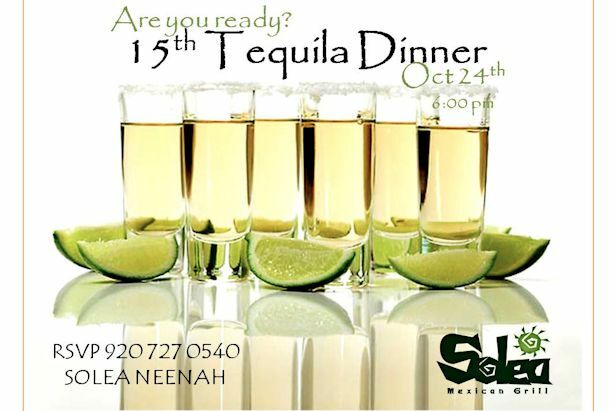 Topo does take reservations but was all booked up for Thursday. Friday there were openings at 7:30 and 9:00, but almost as soon as the concierge had told us that, the 7:30 reservation was snapped up by someone else. “We’ll take the 9:00 one!” Teacher quickly told the concierge. I was both excited and nervous, hoping Topo wouldn’t be as expensive as it sounded. 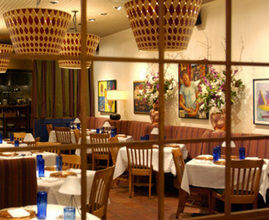 Topolobampo and Frontera Grill share one entrance, with a hostess counter and waiting area in Frontera. Off to one side of the waiting area is a display of Frontera food products, T-shirts, and Rick Bayless cookbooks for sale. Teacher looked over the goodies while I just sat and inhaled: the aroma of freshly baked corn tortillas and Mexican spices wafting through the air was simply incredible. My mouth started watering and my stomach growled – loudly. Luckily no-one else was near enough to hear it, or I would have died of embarrassment. When our table was ready we followed the Maître d’ to our table. He reminded me of Alfred from the 1960’s Batman series: white-haired, tall, thin, and extremely dignified. 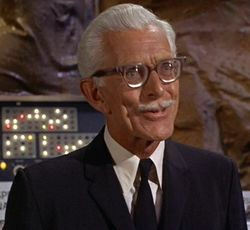 If you’re too young to remember the 1960s Batman, this is Alfred. We followed “Alfred” from from the colorful and festive Frontera to the restrained elegance of Topolobampo. I concentrated on not tripping on my own feet or gaping at the surroundings like a backwoods Wisconsin hick. I’ve been in nice restaurants before, but Topolobampo is the nicest I’ve been in – so far. Entering Topo was like walking through a wall of cotton – sound died behind you as you passed between the wall-to-ceiling shelves that divided the hallway from the dining room. White-clothed tables filled with well-dressed diners stood in two columns near the walls and glowing candles were everywhere. We were seated at a table very near the kitchen – close enough that I could peek into the kitchen through the gap in the curtains. As we were nibbling cucumbers and jicama with guacamole and sipping our margaritas, Teacher suddenly leaned over to me and said in a low voice “Is that him over there?” he asked, indicating the corner booth on his right. 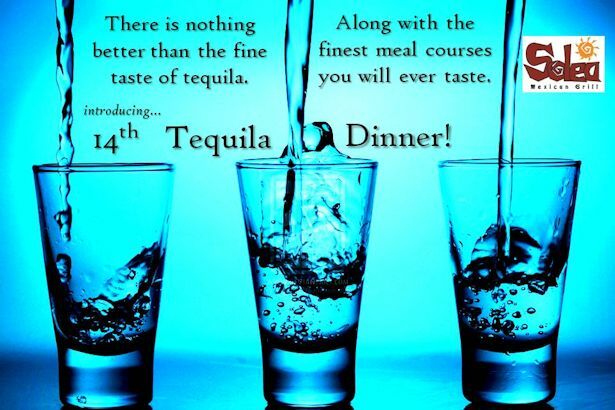 “Him who?” I don’t always catch on quickly – especially when I’m focused on guacamole and tequila. I looked closely at the man in the booth… thin, light brown hair, beard, glasses, wearing a baseball shirt. He was listening intently to the person across from him. “I don’t know… maybe…” it was hard to tell. I kept watching furtively over Teacher’s shoulder. Suddenly the man laughed and looking at the familiar smile I knew without a doubt. “Yes! It’s him!” I hissed. Teacher turned his head to peek over his right shoulder. It WAS Rick Bayless! We were star struck. I wanted to rush over to the table and beg for a photo of him and Teacher together, but he seemed to be with his family and I didn’t want to intrude. Besides that, no-one else else in the restaurant seemed to notice he was there, and I had been raised to never make a scene in public. I settled for keeping a close eye on the corner table, waiting and watching. If another fan made the first move I was ready to spring out of my chair and be second in line for whatever they were getting! “Look at that – he’s signing a book for someone” Teacher pointed out. 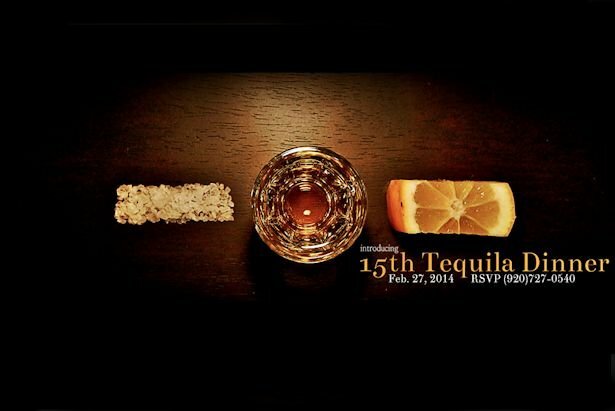 Ah-ha – someone else knew that Rick Bayless was in the house. 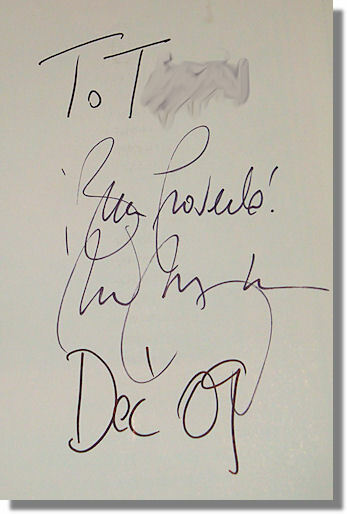 And… my mind connected the dots… if he’s signing a book for someone else maybe he’d sign one for us too! “I wonder if he’d sign a book for you?” I suggested to Teacher. He shook his head, “I couldn’t ask him to do that” he said. 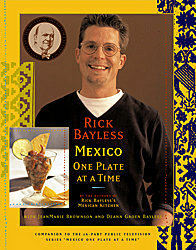 Teacher never ask for things for himself, but I knew how much a signed copy of Rick Bayless’s cookbook would mean to him. The next time our server stopped by I smiled up at him, “Would Mr. Bayless autograph one of the cookbooks that are up front for me?” I asked. I seriously considered fluttering my eyelashes for good measure but decided it would be overkill. “I ask my manager.” he accented and ducked into the kitchen. Time passed and I watched our server pass in and out of the kitchen without a glance at our table. I was beginning to wonder if my request had been blown off when a woman in a black pantsuit stopped at our table. “I understand you’d like an autographed book?” she asked. I was so excited I could hardly form a coherent sentence. “We’d like ‘Mexico One Plate at a Time’ please. I’m Amy, but could you have Mr. Bayless make it out to my husband? 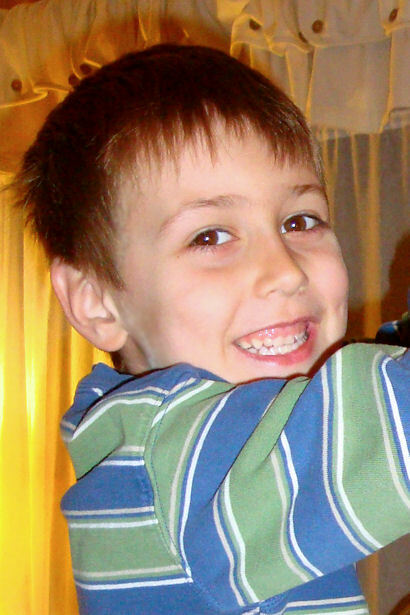 It’s a Christmas present… shhh, don’t tell!” I joked, covering Teacher’s ears. Teacher made an innocent face as the manager laughed and walked toward the front of the restaurant. “Do you have your camera?” Teacher asked. When I nodded he held out his hand. Feeling like a kid about to steal from the cookie jar I sneaked my camera out of my purse under cover of the tablecloth. Checking to make sure the flash was off I handed it to Teacher under the table. We held our breath as he put the camera on his lap, angled it at the corner table, and pressed the button. He hurriedly made sure the photo worked out and had just handed the camera back to me when our server came by to refill our water glasses. Close call, but we had the goods! I admit it’s not the greatest photo ever, but considering the circumstances I think it’s pretty fantastic. 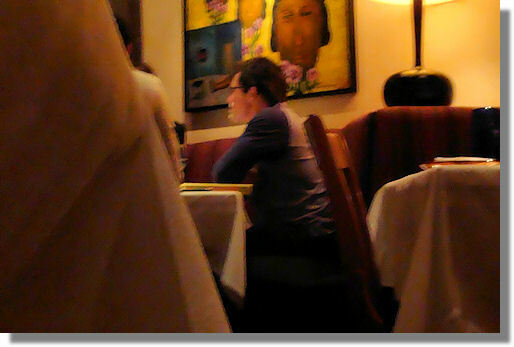 Here’s proof that we were within spitting distance of Rick Bayless! As our heart rate returned to normal I noticed the manager approaching Rick’s table with a book. Look hon, he’s signing your book now! Rude or not, I couldn’t take my eyes off Rick as he signed Teacher’s book. I’ve given Teacher many Christmas presents over the years, but this is definitely one of the most special. Not because of the great meals he’s made from it, or even just because of the autograph, but because of the special memories that go along with it. Merry Christmas, my Love! Usually it will take an individual to place the words in front of you before you recognize that anyone really should take more care.